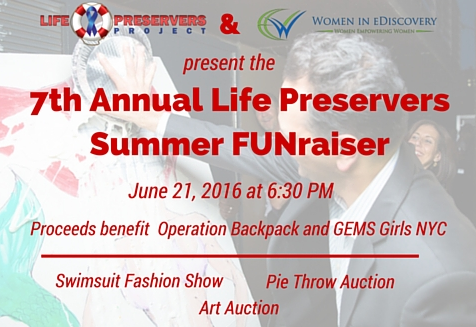 The NYC Chapter will be co-hosting the 7th Annual Life Preservers Summer FUNraiser. We invite you to join us for an evening of fashion, art and CHARITY featuring a swimsuit and backpack fashion show with exclusive designs by KTB Swimwear and the amazing artists from Life Preservers Project's Artist Collective. Backpacks created by Life Preservers Project's Artist Collective will be auctioned off. In addition, to the art auction, guests will have the Don't Miss Opportunity to bid on throwing a pie in the face at the following eDiscovery and information governance professionals. More names to follow. If you are interested in volunteering for a pie in the face, please contact Shana Pederson (shana@lifepreserversproject.org) or Maribel Rivera (maribel.rivera@lifepreserversproject.org). Tickets are $25.00 each and proceeds from the event will benefit NYC WiE's annual charity of choice, Operation Backpack and Life Preservers Project's charity of choice Girls Educational & Mentoring Services (GEMS). Don't forget to forward this invite to your colleagues and friends. If you're unable to join us for the event, please consider making a donation to Operation Backpack and help us meet our goal this year. Thank you to Inspired Review, QuisLex, LexisNexis, Celeritas, EDT, Empire Discovery and Glenmont Group for sponsoring. Additional sponsorship opportunities are available. Contact Shana or Maribel to discuss.